Overview of lymphatic drainage of head & neck. There are no LN in either scalp or face so all drain to submental, submandibular, parotid, mastoid and occipital LN. Deep LN along IJV–> thoracic duct on left and jugular lymphatic trunk on right –> IJV/brachiocephalic vein. Lateral ventricles to 3rd is via foramen munro. CSF reabsorbed by arachnoid granulations –> veins. Sublcavian medial to ant scalene–> Vertebral arteries–> transverse foramina–> foramen magnum–> meningeal branch, ant and post spinal arteries, PICA–> basilar artery –> posterior cerebral –> posterior communicating artery. Under pterigion is the ant division of middle meningeal artery – meeting point of 4 bones – frontal, parietal, temporal and sphenoid. 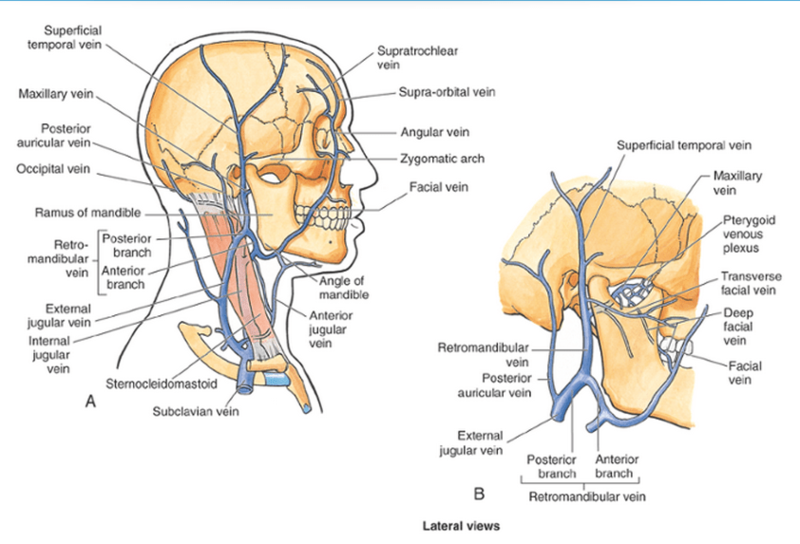 Dural venous sinuses – between periosteal and dural layers of dura mater. CN3,4,V1and V2 are all in lateral wall. At risk of infection from facial vein(valveless) can lean to Cavernous sinus thrombosis–> blindness and other CN defects. Superior orbital fissure – lacrimal, frontal, trochlear (CN IV), oculomotor (CN III), nasociliary and abducens (CN VI) nerves. It also carries the superior ophthalmic vein. Inferior orbital fissure – inferior opthalmic vein, maxillary nerve(CN5), sympathetic nerves. Control of the pupil / pupillary reflexes (Important). Supplies muscle of facial expression, platysma, auricular muscles, scalp muscles. Buccal – external to buccinator to supply it and also supplies upper lip muscles. Sensory nerve supply of face. V1 Opthalmic – via superior orbital fissure–> frontal, nasociliary, lacrimal nerves. V2 Maxillary – foramen rotundum–> pterygopalatine fossa –> branch to pterygopalatine ganglion–> inferior orbital fissure –> orbit–> infraorbital grove–> infraorbital nerve. Zygomaticotenporal branch gives supply to lacrimal nerve? V3 Mandibular/has motor component.–> foramen ovale–> mental, auricotemporal and buccal branches. Auricotemporal supplies parotid. Temporalis, medial and lateral pterygoids. Facial is the main. All are from external carotid. All anastamose with each other and across midline. Facial – EC–> deep to submandibular gland, winds around inferior border of mandible to enter face. Occipital – EC–> passes medial to posterior belly of digastric and mastoid process, accompanies optic nerve in occiput region. Posterior auricular – EC–> deep to parotid and along styloid process. Supraorbital and supratrochlear –> from IC via opthalmic artery. Blood supply of nose (particularly septum). Sphenoethmoidal recess – superoposterior to superior concha receives sphenoidal sinus. Valveless and all partnering arteries. Drain to cavernous sinus as well as IJV. Facial joins IJV opposite or inferior to level of hyoid. Nerve and blood supply of scalp. Arteries in Sub cutaneous layer with anastamoses. Walls stuck to Connective tissue so cant constrict much therefore cuts BLEED!!! What passes through the various foramina of the skull? Faramen spinosum – middle meningeal artery and vein, meningeal branch of V3. Foramen lacerum – Internal carotid and accompanying venous plexus and sympathetic plexus. Foramen magnum – medulla, meninges, CNXI, vertebral arteries, dural veins, ant and post spinal arteries. Jugular foramen – IJV, CN 9,10,11, inferior petrosal and sigmoid sinuses, ascending pharyngeal and occipital arteries. Empties in inferior nasal meatus. Lateral pterygoid – two heads, infratemporal and crest of greater wing of sphenoid, lateral pterygoid plate–> joint capsule and articular disc of TMJ, pterygoid fovea on mandible – protract mandible and depresses chin. Unilateral contraction causes jaw to swing to contralateral side. Medial pterygoid – 2 headed, medial part of lateral pterygoid, tuberosity of maxilla –> medial surface of ramus of mandible – acts synergistically with masseter to elevate mandible. Protrusion of jaw.